We will achieve manufacturing which can only possible by MinebeaMitsumi as an Electro Mechanics Solutions™ Provider contributing for the IoT era by combining Minebea’s ultra-precision machining and Mitsumi’s electronic technologies. You can see MITSUMI ELECTRIC core technologies here. Research on the latest materials is essential to produce new products for the latest market needs. Minebea researches the characteristics of various materials and uses them for product development to respond to diversified product applications. Composition, crystal structure, impurity and hardness of bearing steel directly affect bearing performance and characteristics. Mainly, we use high carbon chromium bearing steel and corrosion-resistant martensitic stainless steel for long-life bearing steel exposed to severe, extreme pressure of 1000 MPa or more. Minebea is particular about materials in developing ideal products. 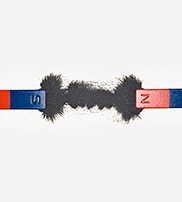 We select magnetic powder for various applications to manufacture magnets internally. This is our commitment to materialize high-performance products. Ceramics’ hardness is twice that of bearing steel, its specific gravity is half and its conductivity is zero. Using ceramic balls prevents galvanic corrosion caused by inner bearing energization and improves durability by smaller centrifugal force at high-speed rotation. 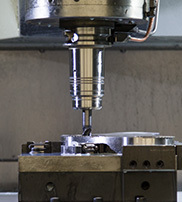 Manufacturing all kinds of parts from machined components to electronic parts require advanced machining technology. Precision cutting, machining and molding of various materials makes it possible to fabricate and produce complex products. Advanced machined products such as bearings, rod ends and motors require precision, submicron cutting, grinding and polishing. Our accumulated ultra-precision machining technology realizes fine part machining. Minebea designs and provides part molds based on advanced designing, using different types of resins according to the application. One of our strength is large-scale global production of precision resin injection-molded parts using our own molds. Various data analyses are necessary for the development of quality products. Minebea customizes and develops new products with its advanced analysis and measurement technologies, using accumulated know-how. We maintain and improve quality by internally measuring ultra-precision parts and chemical substances that affect material quality and the environment. Minebea developed eco-friendly part cleaning technology in the early ’90s and totally abolished the use of a specific CFC in 1993. We have set up internal chemical analysis testing equipment for detailed monitoring to maintain and control cleanliness. Fluid analysis technology is necessary for the development of parts such as bearings and fans that operate in fluid (oil) and gas (air). Thorough simulation of fluid and gas movement and pressure to reproduce and understand phenomena allows more accurate feedback to design. Stable supply of quality precision parts, the strength of Minebea, is supported by plants all over the world. Global facility investment strategy realizes a production process that maximizes the group’s comprehensive strength. 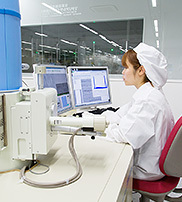 Large-scale automatic assembly lines for mass production of major production are developed and produced in our mother plants in Karuizawa, Hamamatsu, Fujisawa and Yonago. The lines are globally introduced to group plants as unique precision and efficient production lines. 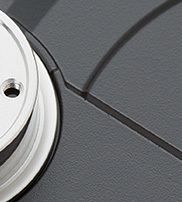 Quality of precision products such as ball bearings, backlights and HDD parts is highly dependent on air dust. Large-scale clean rooms are provided in plants for their production, assembly and inspection. We repeat thorough reliability tests for precision aerospace parts and other parts where lasting and stable performance is required. Testing equipment reproduces various use environments to ensure design and production reliability. Magnetic technology is essential for the development and production of power electronics products such as motors. Minebea internally handles the processes from magnet material preparation to molding and sintering, and produces magnetizing coils to maximize a magnet’s performance. Detailed magnetic field analyses help find optimal solutions for mechanical parts and magnetic materials. They maximize motor accuracy and capability and enhance the accuracy of hybrid motors and resolvers. Motor magnets are internally molded, sintered and painted based on years of magnetic material research. 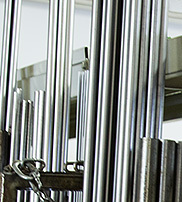 Efficient magnets are installed on our products. We internally produce magnetizing coils for a magnetization process that directly affects motor performance. We design and manufacture magnetizing coils to exert maximum energy on efficient magnets, and this helps to manufacture high-performance motors. Power electronics technology supports efficient rotating devices and electronic parts. Minebea handles efficient power circuit designing, board mounting and precision coil winding. Since the ’80s, we have developed and produced power transformers and PC/LCD TV and projector power supplies. Utilizing these power circuit designing technologies, we develop and produce efficient power supply drive circuits for LED lighting. 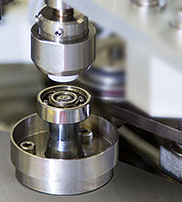 Coil winding technology directly affects the performance and productivity of motors and angle sensors. Minebea’s optimal winding equipment jointly materialized with partner winding machine makers helps to speed up processes and stabilize manufacturing. Efficient and quality board mounting technology is essential for the commercialization of power conversion circuits. 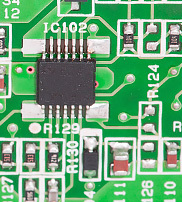 Superior circuit designs cannot be commercialized unless they are applicable to an actual board design. The feasibility of customer required design and applicability to board design are the keys for mounting. Advanced product development requires surface treatment and thin film-forming technologies. Our thin film/coating technology developed internally supports the development of products that have been impossible. Application of thin film/DLC coating secures long-time lubrication between metallic parts. This method provides materials with different characteristics and realizes high reliability. SOS (Silicon on sapphire) is a technology where a silicon film is formed (epitaxial growth) on a sapphire (single-crystal AI2O3) substrate. This silicon semiconductor strain gauge atomically combines with the sapphire substrate to create physically and electrically stable and ideal sensors. Surface of aluminum die cast parts are E-coated with ions of opposite polarity for corrosion- and abrasion-prevention, and form uniform coating. Tribology (lubrication) technology is necessary to reduce friction resistance, abrasion and seizure. Our know-how in lubricants accumulated over half a century allows us to design lubrication according to product application. 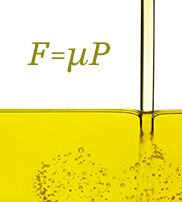 Oil is a liquid lubricant, made of base oil and additives. Shape characteristic of liquid (low viscosity) provides high versatility and low friction resistance, which makes it suitable for lubricating parts that rotate at high speed. Grease is a semisolid or solid lubricant, made of liquid lubricant and dispersed thickener. Being less prone to aging, it is generally used as a lubricant for long-life products. A new-type lubricant, lubricating liner has a self-lubricating property and does not need periodic lubrication. Various liners are used according to the application, such as liners with abrasion resistance and insulating property and stick slip-proof liners with low torque. Optical technology supports mobile device LCDs, LED lenses and other optical products. Thorough simulation-based optical part designing and ultra-precision machining technology for design embodiment are utilized in product manufacturing. Optical guide plate requires design technology that allows uniform light emission across a thin-plate surface. Besides this technology, Minebea utilizes injection molding technology, fine mold machining technology and design-based injection molding technology to produce the world’s thinnest optical guide plates. Various designs are required according to the lighting lens application. Detailed simulation of light behavior makes it possible to design ultra-thin optical guide lights and develop new LED lighting lenses. To efficiently control light with a thin lens, technology of micro-optical element designing is necessary. 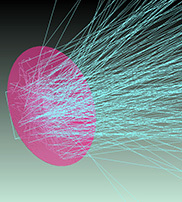 All elements including light collection, dispersion, reflection and refraction are considered for designing, based on optical simulation technology. Composite products made of machined parts and electronic parts require machine element technology that realizes complex designs. Our TRDC (Tokyo Research and Development Center) develops new products by combining Minebea’s machined parts and electronic parts. 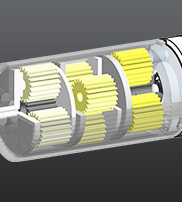 Gears that transmit power are the key to advanced designing. Minebea manufactures gear parts from various materials (iron, plastic, nonferrous metal) based on optimal designs. Elaborate designs and precision parts are necessary for efficient mechanisms. Minebea designs products and produces their necessary parts internally. We produce small, light, high-torque, low-noise, low-cogging and long-life brush motors by selecting the optimal brush (commutator) materials and carrying out precise designing. By combining technologies of Minebea’s load sensors/magnetomerters and Mitsumi’s sensors, we will further reinforce sensing device products which is an essential device for IoT. A force applied to an elastic body is measured accurately from the signal of a strain gauge attached to the elastic body. Strain gauge material and grid shape are designed considering higher accuracy and fatigue resistance. 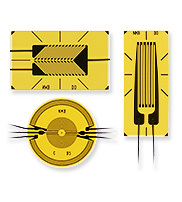 Strain gauges are used for static strain measurement where stability is required and dynamic strain measurement where fatigue resistance is required. This is a small and lightweight vector sensor that detects the translation power in three directions. Our core technology and advantages of a strain gauge are fully utilized in this product.This is used for FA equipment and inner force sense devices such as robotics and others. Piezoresistance is formed inside sensors using MEMS technology, and the resistance value varies with pressure. By reading this resistance value, fluctuations in air pressure can be measured. This device is expected to be used as air pressure sensor to detect atmospheric pressure and altitude being built into smartphones and drones, as well as be used to measure pulse wave as pressure gauging sensor which is incorporated into a blood pressure monitor.